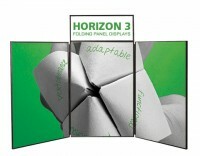 Folding panel table top displays are trade show displays that are designed to hold velcro-backed graphics. The panels are made of a lightweight material that is covered in velcro receptive fabric which allows them to fold up for easy setup and storage. Generally, the graphics can stay attached when packed, which makes them convenient to setup as well as the easiest type of display for changing graphics. Typically, they are used with smaller graphics that are positioned on the panels, rather than covering the entire surface of the display with graphics. Other displays are better suited to that type of full table top graphic mural, but folding panel table top displays allow for inexpensive graphic changes, since only the individual graphics that need updating need to be replaced, compared with a full graphic display where the entire thing would need to be replaced if any information changed. We offer several styles and configurations to accommodate different needs. Look through the selection of products and contact us if you have questions or need help choosing a display.